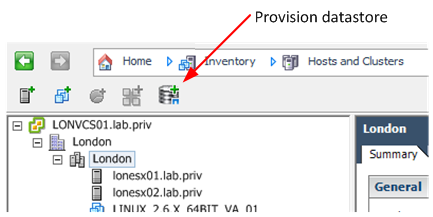 This post is the first part of a how-to series using the VSC 4.1 (NetApp Virtual Storage Console) for VMware. - Select the VMware vSphere Cluster to which you want to provision more storage. - Hit the “Provision datastore” button. Note: The VMFS option is greyed out when the VSC detects FCP is not available, and there are no enabled iSCSI interfaces on the storage controller. The VSC also detects if the hosts support FCP or not. And that’s it, nice and simple! Within 30 seconds or so a new datastore is provisioned.